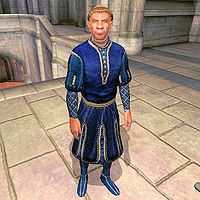 Valandrus Abor is an Imperial priest and the Primate at the Great Chapel of Julianos in Skingrad. He sleeps in his bed in the chapel hall from around midnight to 6am and then wanders around the main chapel until midday. He then spends two hours walking around Skingrad before heading back to the chapel at 2pm and spending the rest of the day there. His clothing befits his upper-class status, consisting of a blue velvet outfit and blue suede shoes. In addition, he carries a few gold coins. Valandrus has the ability to use a leveled set of priest spells and one extra major Restoration spell. In contrast to his two colleagues in the chapel, Marie Palielle and Tumindil, Valandrus is arrogant and haughty but doesn't offer any actual services. His initial greeting says a lot about him: "I'm Valandrus Abor, Primate of Julianos. You may address me as 'Your Eminence'." His response when asked about Skingrad says even more: "A primate has better things to do than provide tourist information. Beggars have plenty of time on their hands. I'm sure you'll have much in common." The citizens of Skingrad haven't fallen for his self-proclaimed skills though. Nobody has a good word to say about him, with comments such as: "I have no idea why Valandrus Abor even serves at the chapel. He's not very good, though you'd hear differently from him. ", "I went to the chapel yesterday, but Valandrus was the only one there. I figured I'd come back another time. ", "You'd be better off praying for a miracle than going to see Valandrus." and "I think I'd rather take my chances with a disease than have that man try to heal me." make it clear what people think. This page was last modified on 3 June 2015, at 21:58.